Today’s topic is the ISA, or the inside sales assistant, probably one of the hottest topics in the real estate industry. Personally, I couldn’t be more of a fan of it. 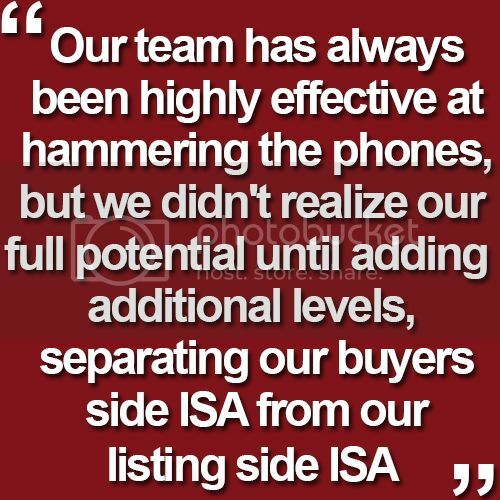 Our team has always been highly effective at hammering the phones, but we didn’t realize our full potential until adding additional levels, separating our buyers side ISA from our listing side ISA. We are also adding people in a concierge-type role to nurture our leads 90+ days before they are ready to buy. Adding this position has really changed our business. If you are scared or worried about adding an ISA to your team, don’t be. It will help grow your business tremendously. If you have any questions, feel free to give me a call or send me an email.